Other festivals have their bed races or boat races, even giant pumpkin regattas! The Lyons Main Street Program's PumpkinPalooza Committee has announced a brand new race to coincide with the fall festival in Lyons, New York on Saturday, October 23rd...PumpkinPalooza Casket Races! Dig up a team (every pun intended) and get started on your customized casket that will compete against others in the 1st PumpkinPalooza Casket Race. 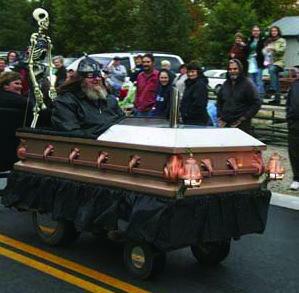 Your team can build their casket out of any material as long as there are wheels, steering and a "driver"...team members can push their entry to victory beginning at 4 pm, right after the Lyons Youth Ambassadors' "Pearl Street Pumpkin RACE" on Church Street in front of the Wayne County Courthouse. After the Casket Race, all entries are encouraged to participate and show off their creation in the PumpkinPalooza Costume Parade which steps off in front of the Lyons Elementary School at 5 pm. Casket Racer entries are welcome from all over the region. Entry forms are available online at www.lyonsmainstreetprogram.org(under the PumpkinPalooza icon) or from the LMSP office at 70 William, Lyons (315)871-4220. 0 Comments to "New Event for Pumpkinpalooza!"